If you want to ski at the best ski resorts in Europe, you first have to qualify what amenities and features make a resort the "best." 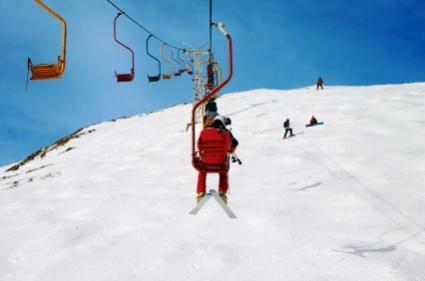 For instance, if you want to ski at a resort with your family, finding one that offers a wide variety of attractions and family-friendly events would probably make the most sense. Similarly, if you're skiing on a tight budget, you may want to find the best resorts for inexpensive skiing. Learn how to find the best ski resort in Europe for whatever it is that you're looking for. If you're a true sportsman or woman, the Chamonix-Mont-Blanc resort in France offers some of the most rugged terrain in the world. Not only can you enjoy a 12-mile ski run, you can also enjoy extensive backcountry terrain, hang gliding and ice climbing. The Courchevel resort in France offers the largest ski area in the world and includes four separate villages with a wide variety of activities on and off the slopes. Half of their ski terrain is geared toward beginners, so it's appropriate for children and families. If you don't want to spend much time on the mountain, you can shop, head to the spa, go bowling, take in a movie or even go ice skating. Head to Switzerland to take in the Gstaad resort area for the most skiing variety. If you purchase the "Ski Gstaad Pass" you can access six resorts spread out over the mountains, all connected through a series of ski lifts. All-in-all you'll be able to access approximately 150 miles of snow-covered slopes with a single ski pass. Do you want to feel like you're really special when you head for the mountain? You may want to plan well in advance for your ski vacation to the Lech Zurs resort in Austria. Only 14,000 tickets are issued a day, which may sound like a lot, but pales in comparison to the admittance of most ski resorts. This low admittance guarantees short waits to load onto lifts and quiet trails. If what you really love to do is get your heart rate pumping while skiing flatter terrain, small hills and dales, head to St. Moritz in Switzerland. You can ski over 117 miles of trails including well-lit trails for night skiing. If you and the one you love find nothing more romantic than cozying up after a long day of skiing, book your trip to Megeve in France. You'll find quaint cottages, cobblestone streets and horse drawn buggies awaiting you, setting the perfect scene for romance. If you're bringing your brood with you when you head to Europe, you may want to book your trip for the Les Gets resort in France. This resort received the "Famille Plus" rating for quality family access, guaranteeing activities for all ages and rates that have been adjusted to accommodate skiers from young to old. When booking your European ski vacation, check for special deals available through the resort's website or through websites like Ski.com, Ski Europe or Europe Mountains. Keep in mind that in addition to the cost of accommodations and skiing, you're going to have to travel to Europe and pay for shipping your luggage and ski supplies. It may actually cost less to rent equipment while in Europe rather than taking your equipment with you. For the absolute best European ski vacation, you want to feel like you spent your money wisely while still having a great experience.